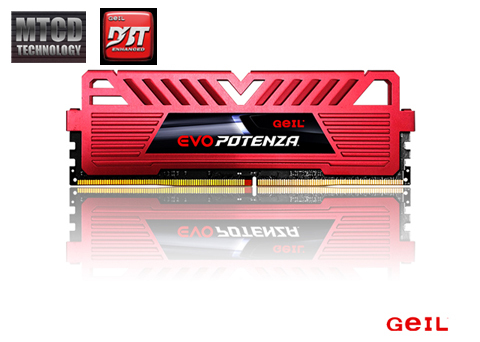 The latest GeIL EVO POTENZA sets the new DDR4 performance benchmark that powers up your desktop. It is designed for the ultimate experience on the latest Intel X99 platform. It delivers a fast speed and operates at optimal frequency, providing the muscle needed to smoothly run the demanding applications and games. The advanced MTCD technology (Maximized Thermal Conduction & Dissipation) arms the heat-spreader to the teeth to eliminate heat buildup. With no exception, the entire series receives GeIL's DBT-Die-hard Burn-in Technology for unbeatable stability and reliability. Install the GeIL EVO POTENZA DDR4 memory into your system, and process large amounts of data or play data-intensive hot titles - without breaking a sweat. Starting from 2133MHz as standard frequency, the EVO POTENZA DDR4 memory delivers much higher bandwidth than previous DDR memory. You can enjoy a faster computing experience for gaming, video & image editing, and other professional applications. Also available in 2400MHz, 2666MHz, 2800MHz, 3000MHz, and 3200MHz, the starting lineup is continuing where DDR3 left off. Available in quad and dual-quad kits, the EVO POTENZA DDR4 memory is designed for the latest Intel X99 chipset for maximum performance and compatibility. The GeIL EVO POTENZA is equipped with Potenza heat-spreader for superior cooling efficiency. Thanks to MTCD technology, the Potenza heat-spreader conducts heat generated by the IC efficiently for superb heat dissipation. The highly efficient cooling performance keeps your memory modules' temperature in check and ensures stable and reliable performance. This thermal solution operates with no extra power cable, water tube, electric fans, or maintenance. The GeIL Die-hard Burn-in technology changes all. It is an ingenious development in memory manufacturing with flexibility in testing functionalities. It eliminates early-failure memory and ultimately provides users with the highest quality memory products. The EVO POTENZA has an ultra-low voltage rating of 1.2V for kits under 2800MHz and 1.35V for 3000/3200MHz.